Three weeks ago I opened our European Summit in London. On the downside this turned out to be quite nerve-wracking and stressful. On the upside, it got me thinking about the state of the travel industry and led me to some interesting conclusions. Essentially, I wanted to ask whether we should be hiding under our beds, fearful of the future, or rubbing our hands with glee? Well, firstly, we travel professionals are almost inevitably industrious, intelligent and devilishly good-looking, so no worries there. However, on a macroeconomic level things seem a bit more worrying. Slowing global growth, weaker developing economies, market instability, plunging commodity prices, high public and corporate indebtedness, the fragility of the European Union – these are all causes for concern and I could go on. It is certainly a materially weaker outlook than in 2015. Several central banks have thrown everything in their arsenal at trying to stimulate growth and inflation, encountering mixed results at best. Within this context, it may seem all doom and gloom but there is a subtext that is critical to travel i.e. consumer spending and the way it is changing. Although median incomes have remained relatively static since the recession, consumers are spending more and critically, they are apportioning more of this spending to tourism and travel. Indeed, consumer spending is driving much of the remaining growth in developed economies. So, on to the data that demonstrates these trends. 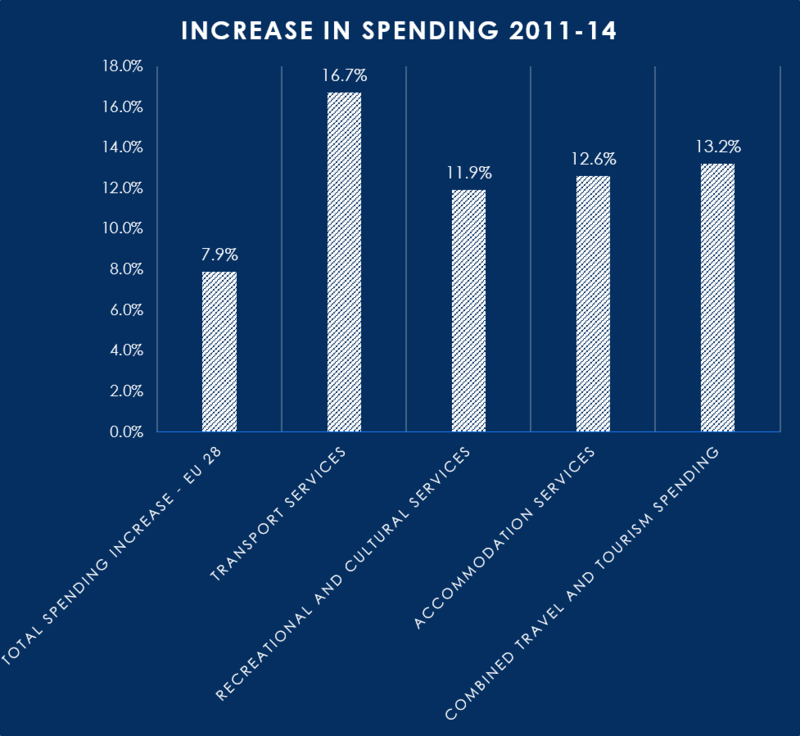 In both graphs I have plotted wider spending against travel spending. 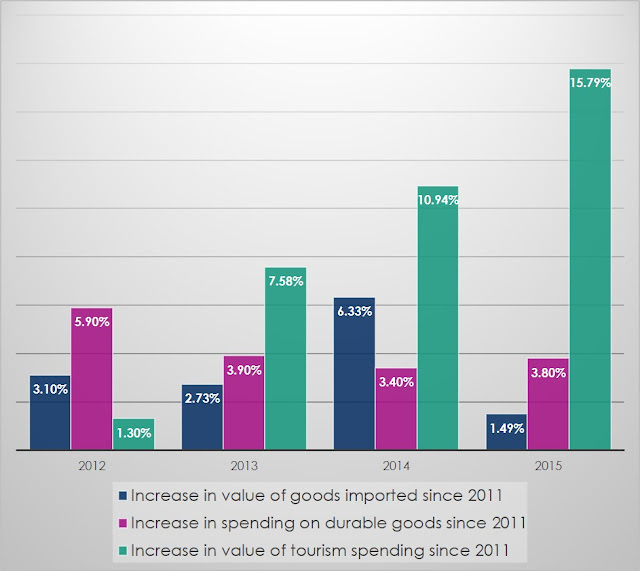 The top graph is for the US where spending on durable goods and the value of goods imported (measures of spending physical items) have increased – albeit at fairly pedestrian rates since 2011 – whereas tourism spending growth has accelerated each year to a high of just under 16% last year. Similarly in Europe, as shown in the bottom graph, total spending has risen 7.9% since 2011 but the combined travel and tourism spend has risen 13.2%. Some of the individual components for this are displayed here as well, with transport services (passenger transport by all means) performing particularly well. I note the lack of rising incomes in particular because this should indicate a depressed outlook for the travel industry. Realistically, travel is a luxury good - or in economic terms an elastic good - to be put on the back burner in hard times. Therefore this potential trend is even more exciting because it is happening in spite of conventional wisdom. It’s early days but this trend appears to be continuing into 2016. As I noted above, the growth outlook is weaker than in 2015 and consumer confidence is down, plus UK and US consumers are saving more of their income. However, travel spend remains robust. Spain's national statistics agency estimates that tourism expenditure was up 7.4% in Q1 2016. Inbound tourism to Germany increased 6% over the first two months of the year. US outbound tourism was up 9.6% in January 2016 compared to the same month in 2015. Domestically, bookings and rates were also up, and indices are predicting growth. So, hopefully this has given you a little bit of hope to ward off the negative sentiment bursting out of most news providers. Of course, we remain vulnerable to a recession but if this trend does continue to be supported by the data then we can expect tourism and leisure to be one of the strongest performing sectors over the next decade.